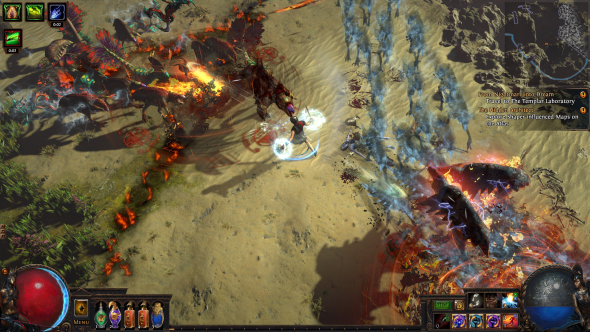 Path of Exile: Bestiary is the action-RPG’s take on Pokémon. This latest Challenge League is stuffed with strange and wonderful creatures – all catalogued in a book that encourages you to catch ‘em all, fill your menagerie, and then sacrifice them in bloody battle to craft new and improved instruments of murder. Alright, so the Pokémon analogy might have broken down at some point before the end of that last sentence. But the Bestiary League is the highlight of Path of Exile: Bestiary, which also brings game-changing items, gems, and bosses to Path of Exile. Like other Challenge Leagues before it, the Bestiary offers a fresh server for Path of Exile players old and new to get stuck into. It runs for three months and ends on 28th May, after which developer Grinding Gear Games will decide whether or not to fold the RPG’s more outlandish innovations back into the main game. Fingers crossed, Pokémon fans. For more self-improvement through swords and sorcery, try the best RPGs on PC. We are back in Wraeclast, the land of damned, dangerous monsters, but this time with the ability to weaken, stun, and then capture the creatures you come across – some 250 regular beasts, and 40 legendaries. Your progress is marked in the titular Bestiary, a lavishly illustrated book that now forms part of Path of Exile’s interface. Once caught, the beasts are sent to your menagerie – “a pretentious word for a zoo,” as game designer Chris Wilson puts it – where you can watch your majestic pets from a safe distance. But you won’t want to just do that and be done with it. You will want to take them out of their Victorian-style pens and beat them up in a process called Beastcrafting. This is crafting in the most abstract sense. 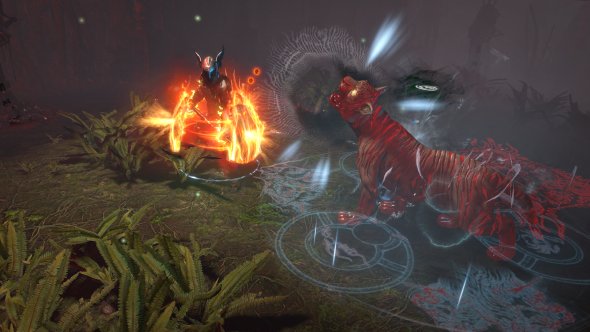 In Path of Exile: Bestiary, you pick a combination of captured beasts that make up a ‘recipe’ that will either boost the powers of an existing item or create a new one. And then you face down those beasts in an arena, the Blood Altar – mixing together all the ingredients of your recipe as if stirring a strange, bloody soup. If your Sacrifice by Combat is successful, you get your new or augmented item at the end. If not, then you might need to go out and capture those beasts again. This potential for failure means that, when Beastcrafting with the Bestiary’s rarest creatures, the stakes are high. 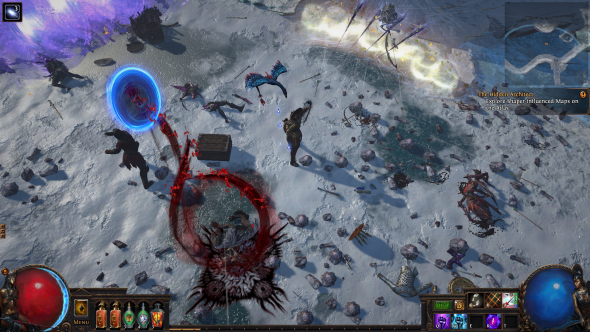 For some time now, Path of Exile players have become familiar with two terrible foes: The Shaper, the antagonist who sits at the centre of the Atlas of Worlds, daring you to poke at his ginormous health pool. And the more nebulous Elder, a Lovecraftian influence on the Atlas who has the potential to pop up all over the place. In Path of Exile: Bestiary, The Elder finally succeeds in exerting his influence over The Shaper, effectively combining two incredibly dangerous enemies in the most deadly fight the game has yet seen. The new Challenge League, too, is big on bosses. Some of the more difficult recipes available in Beastcrafting yield more than weapons. They also grant entrance to spirit boss encounters, which turn out to be some of the trickier fights in the game. Best those and you will gain powerful Unique item rewards. The Bestiary League also introduces four new item sets based on the spirit beasts, which should be perfect fodder for optimised builds. As Grinding Gear has gradually added more and more Unique items to Path of Exile over its four years of existence, they have lost their lustre somewhat. Path of Exile: Bestiary adds to the pile with 29 new Unique items – but it also provides the devs with an opportunity to change that perception for the better with Prophecies. Prophecies are, as the name suggests, visions of your character’s future, courtesy of the NPC soothsayer Navali. Thankfully, Navali is not so much into the dark and handsome stranger spiel – she provides far more specific predictions, along the lines of defeating a particular boss while wearing a certain set of Unique gloves. Live out your fate and the Unique item in question will blossom, becoming a far more powerful Fated Unique version of its former self. There are 30 of these potential transformations waiting in the new update. Who knew gloves could be the Chosen Ones? 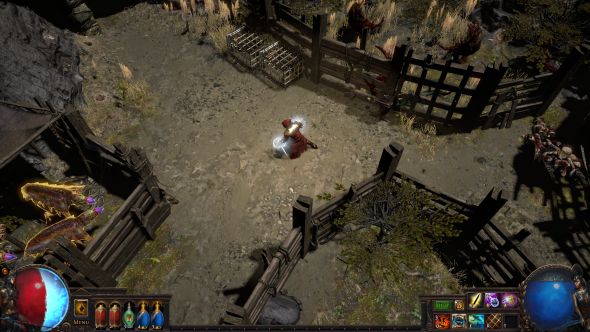 Along the path that every Path of Exile character takes is the Labyrinth – a randomly-generated dungeon stuffed with traps, puzzles, and monsters. Once they re-emerge, they unlock a new skill tree for their Ascendancy class, one of 19 potential builds that can turn them into Gladiators, Deadeyes, or Necromancers. Over time, however, some of the abilities that made these builds special has bled into the game at large, in the form of gems and items. To counter that, Grinding Gear has been working on a large-scale rejig of the Ascendancy classes, ensuring that the building rage of the Berserker, for instance, does not resemble any other combination of abilities in Path of Exile. 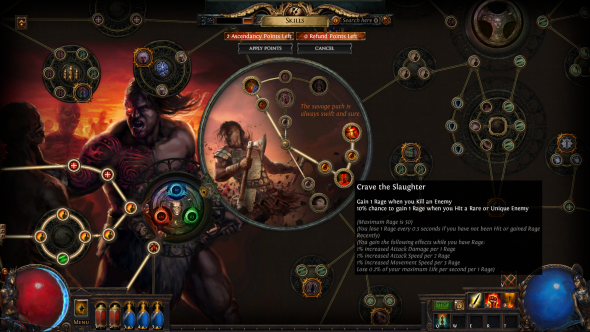 Where victory against The Shaper and The Elder is something you are more likely to see on Twitch than on your own monitor, Path of Exile: Bestiary’s new gems should provide immediately tangible changes to your experience of the game. There are three new skill gems, which are equipped in item sockets and grant a new active skill. One of those is the Spectral Shield Throw, which topples undead like bowling pins in a visually satisfying way and finally gives you a reason to care about what shield you are wielding. Another is Summon Phantasm on Kill, a way to get involved with minions without the boring business of resummoning them – a particular bugbear of Wilson’s wife. It is perhaps the lower-level changes like these that will have the biggest impact on the in-game lives of Path of Exile’s players, who now login for around five hours on average. It seems likely the shrewd design additions and switcheroos of 3.2.0 and the Bestiary Challenge League only sees that number go up.